Supply your cafe, bakery, or restaurant with the appropriate mixing tool using this thick wire 10" stainless steel French whisk. Constructed from fully soldered, 18/8 stainless steel, it is sure to stand up to the demands of a busy commercial kitchen! In comparison to traditional piano whisks, this French whisk features a longer, narrower design with thicker wires in the whip section. The 10 inch steel French whip/whisk is a very heavy duty whisk. The handle is nice and sturdy. It is great for the price and gets the job done. We love using this whisk, . It is small and but it can get the job done if you need to whisk something small. It is easy to wash! great product and great price! Its a whisk, what more can be said. I works as it should, the price is great, which is why we bought them. Arrived on time and we would purchase again. I was a bit skeptical of the quality of the item because of the price but I purchased it anyway and gave it a try. I was pleasantly surprised! This item has stood up to the torture of everyday kitchen use and worked like a champ! It is built well and functions as intended. It's works great for beating eggs to mixing pancakes. Great quality, it is thick and sturdy. Compared to others I have used this one is by far the best. Best price anywhere. This is a great whisk especially for the price. it's very sturdy with no give which is great for whisking and blending harder items. It gets everything smooth and well blended. Strong and really manual whiper, really enjoy working with its amazing perfect stainless steel quality, the size is perfect, and the strong steel is really good for batters!! Great for small batches, the short handle and whisk itself make it so you feel like you've got more power and control. Well built, and has lasted me over a year. Can't beat the bang for the buck with this guy. My go to tool for when making crepes or dosa batter. It has been working out for me for the last year and never failed me. Perfect everyday standard whisk - and again, loads cheaper than even the supply store in town. Doesn't feel cheap at all - heavy weight steel. The wires are very firm and provides very little flex, providing a sturdy whisking experience. Whipping up cream is a breeze with this reliable whisk. The whisk I had at home got bent after being smooshed in the drawer over and over. This is a heavy duty whisk that hardly gets bent. I’m very pleased with this cooking tool. This whisk is great; it's very stiff and easy to use. It cleans well, and easily fits into drawers. It's sturdy, and unlike other whisks, I haven't had any problems with handle detachment. I LOVE this whisk. I wish I would have bought more initially. The French whisk truly is amazing for general use. One thing though, I tend to prefer the 12" whisk over the 10. This French whisk is a great tool to get the job done quickly. If you are using several eggs the whisk makes fast work of the job. It is large enough to go through a thin dressing when you need quite a bit as well as just a few ingredients when you want to get the job done quickly. This is a sturdy whisk that I use to mix up a heavy batter with ease. I use it for a quick whisk when I use a boxed cake mix for a heavier density in the cake. It actually looks like a homemade cake without the clean-up of the mixer parts. I was very surprised at the quality and durability of this utensil. For the price, I was expecting FAR less. Absolutely worth every cent and I would not hesitate to recommend to friends and family. Well done! Awesome whisk! Super sturdy and solid. This replaces a flimsy whisk that I’ve had for years And had to fight when I needed to whisk thicker batters. this one feels like it will last a long long time. This whisk is quite possibly the best deal on this website. What you’re getting for the price cannot be beat. I purchased this whisk about 6 months ago for home use and couldn’t be happier. It is very heavy, strong, and not flimsy at all. However, it is important to note that the wires on this are very thick. Most home-use whisks have very thin wires meant for very thin batters and beating eggs. This whisk is meant for thicker batters and sauces. It is important to note that the wire design is different than the one pictures online for the 10” whisk. It is easy to clean by and hasn’t developed rust. If you need a heavy dust whisk for thick batters, this is perfect. If you need a thin wire whisk, look for alternatives. This is the sturdiest whisk I have ever used! It feels heavy in my hand and makes ganache making so much easier. I think this will last a very long time. We just recently used this with to make waffle batter. It was so easy to use and to clean. The price of this whisk is simply amazing. The shipping is always fast and this site has great quality products. Nice sturdy whisk, like to use when I am whisking a little amount of ingredients; tend to use it mostly for my egg dishes for breakfast. The 10” Stainless Steel French Whisk is made of sturdy high quality steel material. It is durable and very well constructed. It makes great scrambled egg as it gives great aeration. This is the perfect size whisk for most small jobs. it is made from sturdy metal so it wont bend from general use. yet small enough that it will fit anyone's hand. This 10" stainless whisk will be perfect for mixing larger batches. The nice length allows for complete mixing in the deepest of bowls and also a complete mix. This whisk is heavy duty and gets all the clumps out of my batter. I use it for salad dressing and scrambled eggs as well as pancakes. I am very pleased with this purchase. Got this as a gift, it's a real workhorse - Great construction, not nearly as flexible as your usual home whisk. Look forward to using it! These whisks are great I love them. The quality is surpassed by no other for the price. I could not ask for better whisk for the money. This whisk is just the right size. I can use it to make scrambled eggs for a dozen, or crepes for two. It doesn't overwhelm any bowl but can hold its own. Amazing product. I love this 10 inch French whisk. Very durable and it never rests I highly recommend this product for any Home kitchen or business. Sturdy and well built. This is easily the nicest whisk I own at home now. Great for sauces and eggs. The metal feels solid and not flimsy, making it less likely to get misshapen. 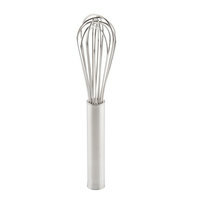 I absolutely love this whisk with its specially designed head it is able to beat up some Eggs in less then ten seconds. Great for parents in a rush every morning. One of my favorite whisks ever! It's really solid in your hand and the 10" length is great for whisking small amounts and getting a good whip. The tines are tightly spaced and firmly set in the handle so you don't have any weak tines creating gaps or bending. This product has great durability and withstands the test of thick soups and sauces. I have bought a few different sizes and they all are as advertised. This is a very durable whisk that won’t get tangled or bent. The 10 inch size is perfect for every day baking and cooking. This whisk is made to last. The whisk is inexpensive, durable, works well, is easy to use, comfortable, weighted, stainless steel, and has very strong wire. My only issue with it is that it is hand wash only (probably due to the weights in the handle), which is a bit of a hassle. I do generally recommend the whisk, just be aware that there is a bit of cleanup involved afterwards. This stainless steel whisk is very handy when making gravy and sturdy! Great quality kitchen item for the price and fast shipping, which is great! The 10 inch steel French whisk works great. 10in is on the short side so it's good for shallow dishes and bowls. It cleans easy and looks great. This is a great stiff whisk. I can't stand the cheap ones that flex and bend every time I try to mix something. I used this mainly for mixing pancakes and muffin mixes. I also run they through the dishwasher without issue. I've been wanting a nice stainless steel whisk for awhile that is light weight and doesn't rust. This one is it. Works great and hasn't rusted. Good quality. No issues. Stands up to constant use in kitchen. Perfect size for small jobs. Would recommend having several in the kitchen. Great price! This whisk is the perfect size for small batches. It works great in small bowls, but be careful if you’re whisking in pans so that you don’t scratch the bottom over time. It looks and feels great – as if I spent way more than I actually did. This whisk is great. Made of sturdy stainless steel so it is a bit heavy and a little longer at 10 inches. This is french-style so whisking is easier and with great results in less time. This 10 inch whisk is extremely sturdy and well made with thick wires. It feels very good in your hand. It is best for mixing pancake and similar batters. Great product. I enjoy using this product in the kitchen. I am able to get a lot of things done with this product. Very sturdy. You can feel the quality of this whisk as soon as you pick it up. It is a heavy duty whisk, unlike many others out there. This 10 inch whisk does a great job of mixing up many types of liquids. this is the sturdiest whisk i have yet seen--it is so well made that it doesn't bend and mixes wonderfully as it has two layers of durable metal caging instead of just one. It looks it will last a long time! I like this 10" Stainless Steel French Whisk. Really good for whipping egg whites, mousses, whipping cream and custards. I will definitely purchase this whisk again. The ten inch Stainless Steel French Whip is perfect for small to medium sauce pans and even stainless steel stock pots. I frequently use it for mixing everything from scrambled eggs to pancake batter. The handle is heavier than I expected but not too heavy it is difficult to handle. First off this is a solid whisk. I mean it is well built. It would be great for a more runny material. My problem was that I was mixing a batter with it and it was too thick. So while the whisk does not work for what I intended to use it for, I will still find a use for it just because it is so solid. Bigger than I expect. It's too big to whip sauce on the bowl. For our noodle shop, I won't recommend. But the quality is good. The 10 inch stainless steel whip is nice size for stirring sauces. This French whip has a lot of wires and a weighted handle so it feels comfortable in the hand. The wires on I French whip are thicker and stiffer than a piano whip. The French whips unique construction is noticed immediately when you begin use. It's durable body is dishwasher safe, made of pure stainless steel and the price is right. The perfect French whip! It looks and is excellent quality, plus it's very affordable. Easy to clean since you can just put it in the dishwasher. The 10" Stainless Steel French Whip is the best whip ever! I love it! The quality is exceptional and the price is very reasonable. It works great! This is an incredible deal! This French whip is the highest quality you can find. It is extremely durable and easy to clean. I only wish that I would have purchased this years ago. This product is amazing, we use it everyday! We love this product and regularly use this because it make a wisp for eggs and other things that we make regularly. I love this high quality stainless steel french whip! It is such a great product for low buck. And size is just perfect for multiple use. The perfect size for small to medium jobs. Fits perfectly in your hand an dis incredibly sturdy no matter how rough you are with it! A great French whip to beat cream and eggs for our bakery. I love the price point of the whip as well as its in durability. No more flimsy whips that bend over time with multiple uses. Absolutely the best whip for the money. The handle is thick and heavy making it feel very solid while using it. The wire is also large enough to not be flimsy. I highly recommend this product. This product is such a good buy! Got six of them for different uses. I use it for egg yolk whipping, fresh cream and even tatziki mixing. Very affordable yet good quality ! This is a commercial grade heavy duty whip! The price is incredible. I have used this for everything from eggs to cake mix. This is a keeper. Much thinner wires than the Piano whip that's offered. Really good for whipping air into egg whites or whipping cream. The wires are attached to the handle in a way to prevent water from collecting and rusting the equipment. I went through a bunch of different wisks before I got to this one that gave out on me in a few months. This one i have been using for more than a few months and it has no indication of going out on me!! :) and for the price, well, I have not found a better price and quality on wisks otherthan webstaurant! Heavy wire whisk is great for working and breaking up clumps and mixing dry ingredients as well as for working with whipping thicker batters and icings. Fabulous whisk for the price...It is much heavier and better constructed than my other whisk that cost twice as much. I highly recommend this product! Heavy duty steel construction. The only down fall is that the whip is quite short in comparison to the handle. Cleans well and should last forever. These are very very well made and work perfect for whipping cream and mixing anything by hand. I also use them to mix chocolate smoothly. This was of very good quality. The wire seems to be connected to the handle very well and should not come loose even for heavy usage. We bought this French whip to use with our waffle batter. we love fresh pancakes and waffle cones for our kids on sunny days, this whip does a perfect job at thinning the batter to a great consistency. 10 inch whip good for smaller tasks and home use. These whips are a good value for the price. The wires are solid and I have not seen one fail yet. The handles have some loose beads or something which rattle and the seam around the cap is not perfect, but for the price, it's a good whip. This whisk has a heavy duty handle and is great for mixing gravy and sauces in smaller batches. They are easily cleaned and last a long time. We have had them for years and needed more. WOW how can they make such a nice whip for this price. heavy wire and heavy handle. No issues with rusting. Very durable. and will last a long time. .
wow the 10" Stainless Steel French Whip is awesome, the handle is very sturdy, the metal of the whipping end is very thick and whipped up my eggs and sugar perfectly in just a few seconds. This product was delivered quickly. Item was as described. Very high quality and will absolutely re-order again. I highly recommend it and price was a great value! I was not expecting these whips to be as heavy as they are. They are perfect. I was able to use it making gravy and icing. price is good. Very petite in size, actually much smaller length then expected, but still a kitchen weapon that every restaurant needs to have, best for cold products, but handles anything with zest. Great buy, affordable, needed. This is a good sturdy whip. The wires are thicker so are nice and stiff. It is well balanced. My only gripe is that it technically isn't dishwasher safe. I have forgotten and put it through the dishwasher and so far it has come out okay, but I am not sure how it would hold up to repeated washing. High quality whip at great price. When some of our older whips started breaking down I found these to try out. We are very happy thus far and will order more later to replace aging ones. We worried when we got this whip that it was not very sturdy, however, we were pleasantly surprised that it is not only the sturdiest but the best to hold up against cleaning. We have others that are starting to show signs of rust, but not this whip. I bought the larger 16" french whip for my business to make sauces and whatnot. I liked the product so much that I purchased a 10" one for my home. The handle has a really good strong feeling to it. This is the perfect go-to whisk size. It is sturdy and feels well balanced in hand. This is a whisk that will hold up in thick batter. The thick wires are easy to clean. I have a plethora of whisks on hand at all times. You never know what size you're going to need! This particular one is fairly petite, and I like to use it for cooler applications. When using over heat, I prefer longer whisks. These are sturdy and strong and will last a long time! This is my go-to whip for making sauces at home. Love the solid construction and how it feels in the hand. Most whips I owned in the past start falling apart after a year of decent use, sometimes sooner. This has been going strong for almost a year and I think it will last a long time. Gotta love utensils made for commercial use. This Whip is perfect for whipping up everything from pancake batter, cakes, to eggs and is so easy to clean. It makes everything so much easier and quicker to mix and cuts time in the kitchen down. It is excellent for me to mix up my homemade ice cream that I make when my family gets together. Perfect for pancake batter or muffin batter! It stands up on its end and that is very convenient(space saver on the counter). Great quality, I will buy more! This is my favorite French whip. I've bought other brands and they don't hold together over time, this one is amazing! I have a few other sizes and I just love the quality of the product!! I had gotten a 14" whip and needed something a bit smaller for things like eggs. Eggs was no problem for this . Nor was waffle batter. Well made. This worked perfect for my whipped soap. I have finally found one strong enough as any of the others I had ordered for this purpose had not worked previously, which is understandable considering what I am using it for. Love this whip! It's perfect for small jobs like string my pastry creams but is also great for hand whipping fresh cream. All round it's well made! This whip is nice and sturdy! Perfect for making small batches of Royal icing by hand! And it is also easy to wash and keep clean. Great sturdy whisk! I immediately noticed the quality difference between this whisk and my store bought one. This thing is going to last you forever and I will be ordering more of these soon. I use this for all sorts of home cooking. It has held up to thick gravies, using it with cast iron and still is able to mix delicate cake batters. It is the best whip I have ever used, bar none. Could not believe the quality of this whisk. I saw many positive reviews and decided to try it out. This whisk is well-made, decent weight, looks beautiful and, at this price, why not. You won't regret it. with any whip you need two things for sure. it has to be well built and easy to clean. this whip has it all and a great price to go with it. our chefs really enjoy this French whip. I am very pleased with this whip. It is quite sturdy and heaveir than I thought. Making whipped cream or just whisking eggs is quite easy. I also like the lenght of the whip, not tloo long like my older whips. Good quality whip with a nice weighted handle. I didn't know the handle was weighted when I purchased it, and it makes a difference when whipping cream. It doesn't require as much work or wear on your wrist as much. This classic french whip is the perfect mixing tool. The all stainless steal body makes it very easy to clean. You just can't go wrong with this whip. There are many whips out there but this one was very well built and easy on the hands. The 10'' inch length was perfect and seems like it will last a long time. I'll order more very soon. I loved this french whip so much, so much so that I am going to have to order another one. It was stolen within a week of purchase! I use this 10" stainless stell french whip when mixing large amount of colorants for my soap making hobby. The 10" size is perfect for my deep bowls. I was really impressed by the quality of this whip. You can really beat the heck out of your ingredients and this whip won't show a sign of use. Great quality! A very strong and sturdy whip. I prefer a whip like this to a whisk with thinner wires that does not hold up in thicker batters. A+! This is now our go-to whip, great length, great weight. We kind of fight over it in the kitchen now... We will need to order more so that everyone had their own.. Wow!!! I am so impressed with this whip. The quality is superb. The whip is the perfect size, well balanced and comfortable to hold when using. I used it for the first time this morning and whipped up brownies in less than a minute! These are truly the only whisks you will ever need in the kitchen. They are strong, built to last and attractive. Great for delicate egg whites and thick batters. I really like the length of this 10" French whip. Has a large handle that fits comfortably & doesn't tire your hand easily. Highly recommend this whip. This is a great whisk for beating eggs and preparing omelets! It is very sturdy and the stainless steel handle makes for a solid grip. The 10" Stainless Steel French Whip. It is great I love Using this whip for wipping my scrambled eggs and sauces. It works great and is well worth the price. I love French style whips! They are the best for getting in the corners of straight edge pots and pans! I like using this smaller 10 inch whip for making whipped cream!! This 10" whip is great for small jobs and the price is great. I keep alot on hand for small jobs.Great quality. I'm very satisfied! These were such a good price i was worried how they would stand up. But they are doing great and weve ordered many more off of here sense then! Great product!! Every kitchen needs a good selection of whisks (whips). Webstaurant has all sizes at a fraction of the cost at any kitchen store at the mall. Thanks WSS! This is an excellent stainless steel whip. I use this smaller one for a lot of sauces, and little dressing items. I prefer the bigger one for most of my needs. Excellent quality and very durable. This whip is a little small for my needs. It is a good sturdy whip, but a little too stiff for me and I prefer the 12". A very sturdy whip, and a heavier weight than I expected. Very good quality. I only wish it had a loop so it could be hung on a hook. This whip is good but did not last very long. The whip soon fell apart after repeated use but did the job at first. I like the nylon handle whip better. This is a sturdy, well crafted whisk good for any task you put it to in the kitchen. I highly recommend it to the serious as well as a novice cook. Great quality! This is a fairly heavy whip that gives a lot of power with just a very little effort. Great for beating eggs, wet ingredients, light flours, or small & quick whisking jobs. This is a very sturdy and heavy all purpose whip for the home and professional kitchen both. This French whip has very good beating and whipping action. It was a little short for some of my work but over all it worked quite well and I highly recommend it.